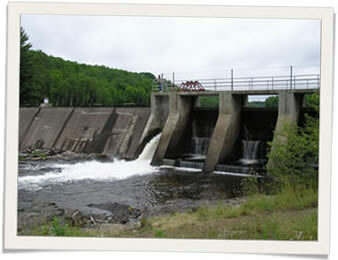 The High Falls in Bancroft is located on the York River at Birds Creek, and has a dam built on it’s crest to control the level of Baptiste Lake. The amount of flow over the falls varies greatly so more then one trip may be required if you want to see the Falls at their fullest! The photos below were taken mid-summer. As you can see the level is low. I would think Spring would be the best time to see the rushing water. You can drive to the falls with no problem, however, please note that the property at the bottom of the Falls is posted as private property. How to get to High Falls from the town of Bancroft.